I recently finished reading Cathi Bond’s Night Town. Okay it didn’t literally knock my socks off, I’m still wearing socks, though I probably shouldn’t be. It is a barefoot sandals kind of day today. But you know what I mean. I was impressed. I’ve known Cathi for a while. She was a frequent contributor to CBC Radio shows such as DNTO, which I used to tech for occasionally. Once she contributed a lovely high production commentary to one of my numerous attempts to get a science fiction radio show off the ground. We also worked together on an experimental non-linear web-based narrative project called Vega that never quite got off the ground, but that did manage to be at least one brick in the wall of our story-telling education. Whatever other bricks have been a part of Cathi’s story-telling education, they’ve clearly paid off. With a debut novel this good, I can only imagine how good her subsequent novels will be. What follows is an adaptation of a post I placed on Good Reads upon finishing the book. The post is mostly just praise, I haven’t really gone to the trouble of summarizing the plot of the book. So if you want to know what it’s about, you’ll have to look elsewhere. Or better yet, just read the book. That should give you a pretty good idea what it’s about. Though the writing in Night Town is professional, gripping and taut, I did not always find it an easy book to read. The protagonist Maddy’s descent into hell was harrowing. I didn’t want to be in that world with her. But I wanted to know about that world. I felt like I needed to know about that world. I kept wondering, how did Cathi know about that world? It all came off as terrifically authentic. Maddie’s point of view was always consistent and disturbing. I wondered about her reliability as a narrator. Almost everybody in her story shut her out (even her mother, tragically), nobody offered her the support and love she desperately required, at least according to the story as she tells it. I suspected that she was a love filter, filtering out love and support, not absorbing it when it came her way, so although it might have been present in her life, she filtered it out so of course it wasn’t reflected in her story. Or maybe there was none at all and that’s why turned out the way she did. They say that lab rats raised alone without comfort and support invariably become sociopathic. The characterizations were deft and superb. Aunt Anne was real. Grandpa was real. Dad leapt off the page. The bit players, especially Gabe, lived authentic (if pathetic) lives. And Maddie of course rang truest of all. 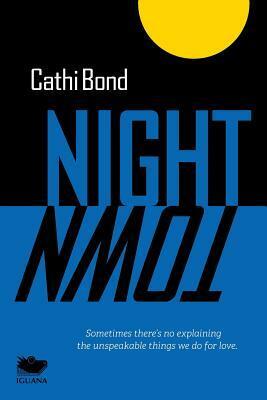 I wondered how Cathi would manage a happy ending without it feeling trite or stage managed. She pulled it off. I wanted there to be hope at the end and there was. I couldn’t have borne it had there not been hope for Maddie. I want to know what became of Lily. But that story must be left unsaid, the same way the true nature of Gabe and Lily’s relationship is best left unsaid. I think this is not only an excellent book, it’s an important book. A book with difficult subject matter that a lot of people might not be able to get past — the exact same people that most need to read it.
! We must get this review out there. Somehow! Just what I needed to read today. How’s the writing going?